A flamingo's long legs and neck, webbed feet and even his trademark pink hue are all influenced by his environment -- his adaptations make him uniquely suited to live in the habitats he calls home. Flamingos live in habitats around the world that have a few key things in common. Flamingos generally live along the coast, where they can wade into the water for feeding. Their long, spindly legs allow them to wade in coastal waters, while their webbed feet are adapted for balancing on the muddy, uneven surface below. These birds often adjust to the cold water of the ocean by balancing on one leg, which conserves body heat. They may even default to one-legged standing in warmer waters, though, as a type of resting state -- balancing on one leg is easier for a flamingo than it looks. A flamingo's habitat provides him with an abundance of natural food sources. Wading in the water, he bends over and dips his head below the surface -- his long, crooked neck comes in handy while he's hunting this way. He eats whatever he can find down there, sucking up mollusks, shrimp and small crustaceans that are hiding in the water and mud. This is where many flamingos get their pinkish color -- they eat so much pink food, like shrimp, that it changes their hue. 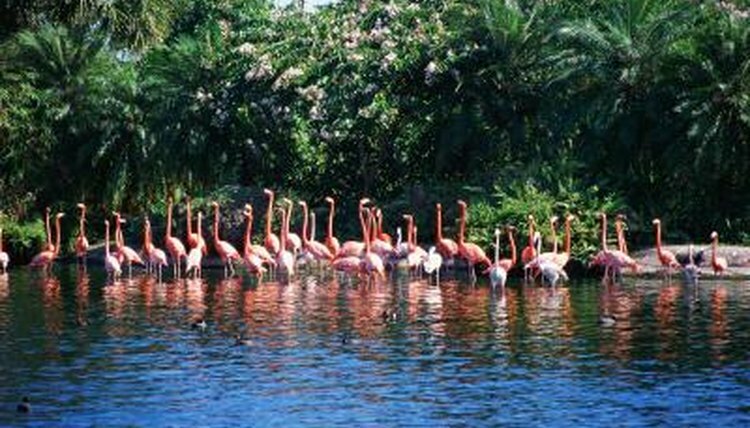 Flamingos live in flocks all over the world, though they generally stick to areas where the water is warmer. They can be found along the eastern and northwestern coasts of Africa, southern Asia and the Gulf of Mexico, where their natural food sources are plentiful and the water is warm. They also prefer brackish waters and estuaries. Despite their long, gangly legs, flamingos are graceful and aerodynamic creatures. This enables their habitat to change depending on the weather and how plentiful food is. For safety, they travel in flocks called colonies. These colonies can fly faster than 30 miles per hour and in a single night may travel a distance of 300 miles or more.